I never tire of the view out to sea through the small, square kitchen window in the cottage. It’s ever-changing with the seasons, the weather, time and the tide. Yesterday I looked out to west coast mizzle (a fine Scottish partnering of mist and drizzle). Beyond the rain-soaked field the water was slate-grey and angry. In the bay three small boats rocked and bucked as the waves, chased onshore by the wind, slapped their sides relentlessly. The sky was low, and across the loch the land was just a suggestion of a form – lost in the mist, or, indeed, the mizzle. Today, however, it sits solid and clear on the horizon. The purple of the heather on the ridge gives way to green as the trees follow the gullies and burns down to the shore. The sea is flat, the three boats sitting safely in its arms. The headland to the left – already bright with new growth pushing through the burnt-out scrub – reaches into the loch, its fingers testing the water. And the wind has stopped. It’s a welcome relief, this calm. I sit out on the bench with my morning coffee listening to the birds. And he did! Four crabs and a lobster no less. A sailing boat motors out of the marina and cuts across the water. The fish farm squats in the distance – a strange, dark, metal island. A local, who once worked there, described how thousands of beautiful beasts jostle for space. The sailing boat gives it a wide berth. I hear a grumble, roar and steady chunter as my neighbour heads off round the coast to check his pots. I’m hoping he’ll drop off a crab for me later. I live by the sea, but I have to pinch myself to believe it. In the city the cry of a gull was enough to transport me to a salty beach with rock pools and sun-dappled paddling. Now it’s part of my everyday life and that’s been a wonderful thing. The sea speaks of something wild and free. I like to stand on its edge and take in the expanse until my eye settles on the horizon. I imagine the riot of life in front of me below the surface. And on the shoreline, that magical place where land and sea meet, you can dip your toe into this other-worldly-world, join the sea creatures and glimpse their lives. Delicious crisps made from dried kelp. I’ve been taking my ‘Edible Seashore’ handbook with me on my beach foraging trips. It covers anything that can be gathered from the top of a seaside cliff to sea as far out as waist deep on a low spring tide – perfect for me as I’m yet to get the boat in the water. I’m an old hand at gathering mussels (they’re everywhere, you pick the big ones off a rock at low tide) and cockles (there’s a cockle bed on the beach, you rake the sand at low tide and they’ll pop up), but I’ve never found a razor clam, oyster or scallop. I’m hoping this book will help me. Alas, it won’t be until September, as the shellfish rule is only collect when there’s an ‘r’ in the month – something to do with breeding and water temperature. It’s a shame as my neighbour says there’s a load of oysters on the low-tide rocks near White Bay. 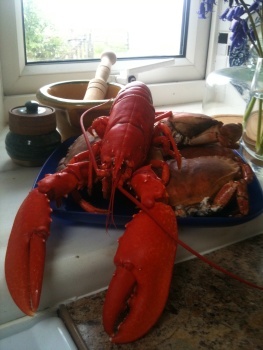 But shrimps, lobsters and crabs are fair game all year round. 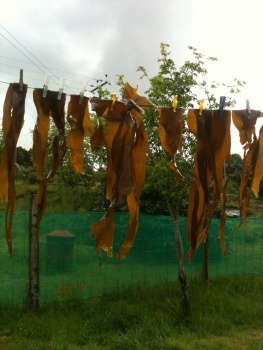 Kelp gathered at low tide hanging out to dry on the washing line. As, of course, is seaweed. Yesterday I dragged some kelp in from the rocks at low tide. I rinsed it and hung it out to dry on the washing line where, in a matter of hours, it shrank and darkened until it resembled a row of bedraggled stockings. After an evening in front of the fire, the kelp was crispy and dry and ready to cut up and store. Kelp (‘Kombu’) is used a lot in Japanese cooking. It makes dashi, the stock for miso soup. You can also add a few bits of it to stews and soups for flavour, though some say it just makes everything taste faintly of iodine. 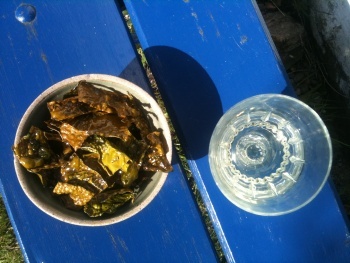 I made a batch of kelp crisps by chopping dried kelp into squares and deep frying them for about five seconds. They were delicious – salty, with the bubbled texture of poppadom. We offered some to a passing man out walking his dog. ‘That’s a strange thing to be making on a Sunday’, he remarked and went on his way. I also have a worky website.